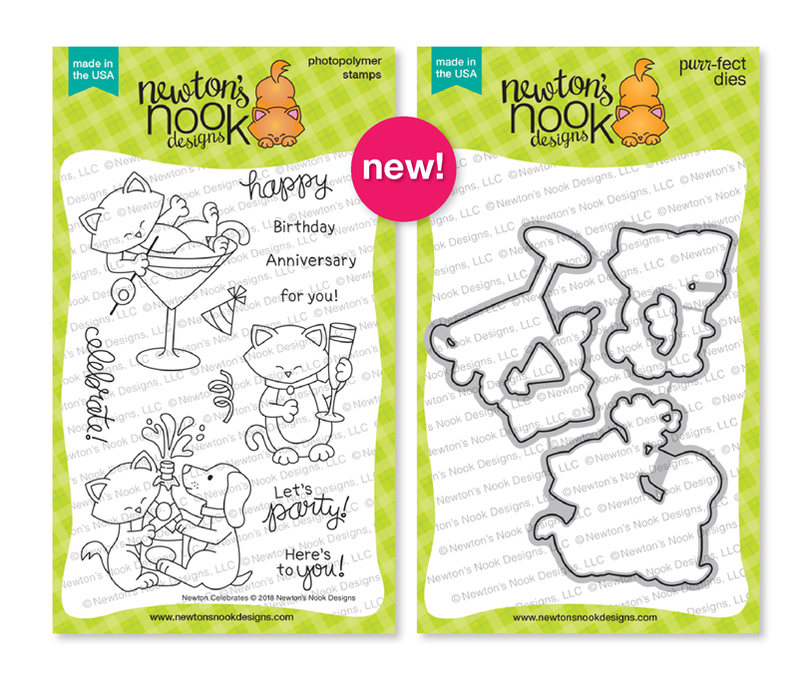 Hollybeary Creations : Newton's Nook Designs Release Day 3! 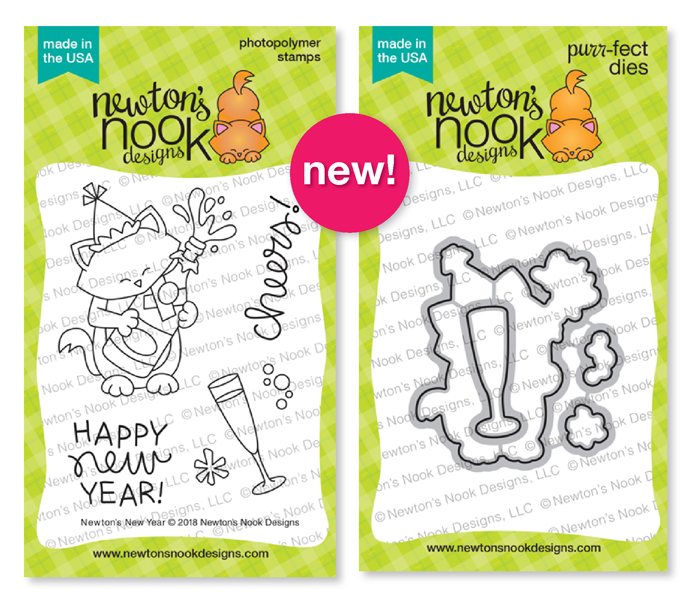 Newton's Nook Designs Release Day 3! 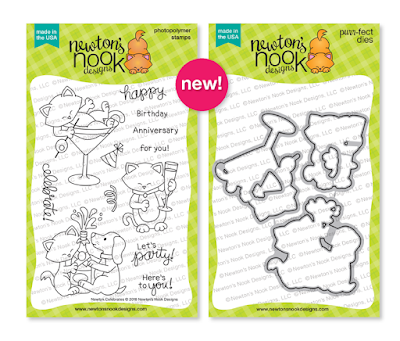 It's day Three of the Newton's Nook Designs November Release Sneaks and today we are sharing Two Fun Newton sets. I created a Fun Birthday card sure to make anyone smile. I created the background with some Fun Pattern Papers and the Frames and Flag Die set. And then I stamped and colored Newton in with some Copics. I used the Coordinating Dies to cut him out and adhered him to the card front with foam adhesive. I created a sentiment banner with the same die set and stamped the Birthday Sentiment. This set is full of different sentiments to use for several celebrations. For an extra pop of color, I added some sparkly gumdrops. 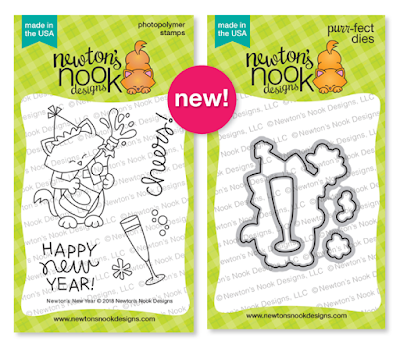 Up next is... Newton's New Year and it's coordinating dies. This is such a cute set and it pairs well with the Newton Celebrates set like I used here. I used the bubbles stencils to create a background and then I stamped the sentiment in the upper corner. I stamped and colored the images in with Copics and added some details with a White Gel Pen. Then I added some Silver Glitter with a Wink of Stella pen. in the second is great. Such cute cards. I love the stamp set to celebrate the New Year. 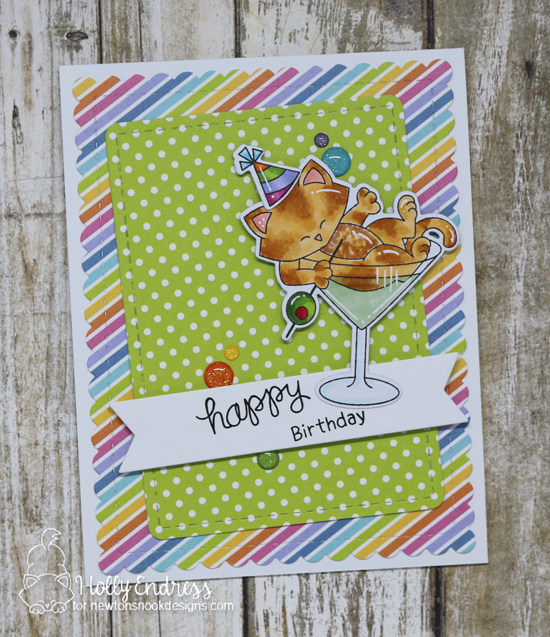 I love how you colored the cats and that second card with the floating down bubble stencil! I HAVE THAT! I like your idea! Beautiful cards, thanks for the ideas. Fantastic cards! I love the dotted background on the rainbow stripes! Beautiful and hilarious cards!!! Awesome use of colors!!! Your cards are so sweet and adorable! Love the backgrounds! I love the white line accents! I must give them a try! And I love your bubbly background for the adorable celebrating couple! loved the design of your Newton birthday card - especially loved how you colored him, so sweet! and the New Years card is very festive - Happy Holidays! The first card is adorable and so festive in coloring! Love that. And I love the grey kitties in your 2nd card; so sweet. Like the bright cheerful colors & background. Such fun & festive cards! Newton really knows how to celebrate in style! Super cute cards! 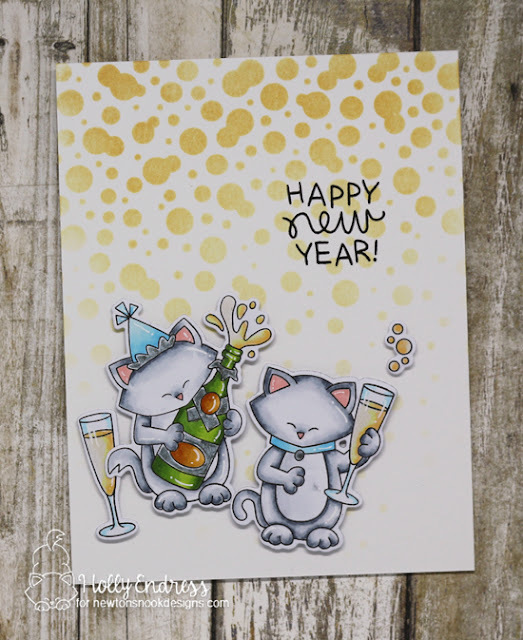 I love how you used the bubbles stencil for the top half of the card! It really looks like the bubbles floating up from the Champaign bottle! Very clever and cool looking! I love this release and your beautiful cards! Adorable!!! I just placed my first order can’t wait to get it! Thanks so much for the inspiration!